Cynthia Atkin, Vice Chair and Councillor Scott Dickinson, Chairman of the Northumberland Health & Wellbeing Board sign up to the dignity code. Northumberland County Council has reinforced the importance of treating elderly people with respect by signing up to the dignity code. Dignity Action Day (DAD), which took place on Sunday, February 1, is an annual initiative aimed at bringing staff and the public together to make a positive difference to those receiving care and support. This year the day was celebrated at the National Pensioners Convention and Coun Scott Dickinson, chairman of the Northumberland health and wellbeing board went along to show the council’s support. 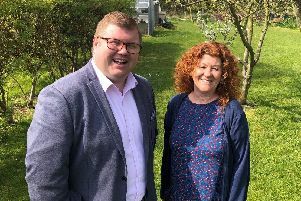 “Treating everyone with dignity is a fundamental part of our council’s service ethos but we can all do our bit to support vulnerable people whether at work or in our communities,” he said.